LOS ANGELES (CNS) — Seventeen people from the Los Angeles Archdiocese were in Rome March 25 hoping to ask Pope Francis to urge President Barack Obama to strengthen efforts to enact comprehensive immigration reform legislation. 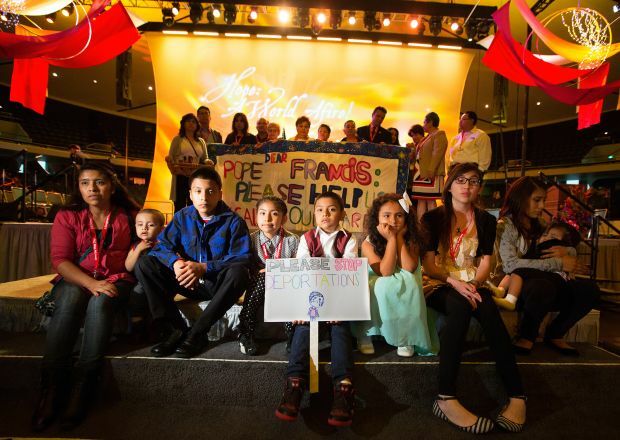 The group, which included two children, left Los Angeles March 21 without an appointment with the pope, instead placing their desire in prayer while invoking the pontiff’s oft-repeated call to mercy and justice for the world’s poor and marginalized people. On March 26, they planned to attend the pope’s weekly general audience. Obama was scheduled to meet with Pope Francis March 27 in the midst of a five-day trip to Europe and Saudi Arabia. Los Angeles Archbishop Jose H. Gomez, who has made immigration reform an archdiocesan priority, blessed the contingent as the archdiocese’s annual Religious Education Conference closed March 16. The four-day conference at the Anaheim Convention Center attracted 40,000 people to hear presentations, participate in workshops, and discuss ideas for evangelization and education. The first day was devoted to youth-focused activities, followed by three days for workshops and presentations. He told the thousands of people gathered for the liturgy that the beatitudes offer a path to grace and service for the church to follow. Archbishop Gomez also recalled the work of Cesar Chavez, the late farmworker advocate, union leader and civil rights leader, who rose up to embrace the beatitudes and to seek justice in the world. He said Chavez can serve as an example for everyone. “He fought for justice for his people, using the spiritual weapons of prayer, fasting and self-sacrifice. And he always urged nonviolence,” he said. Archbishop Gomez tied Chavez’s work to a renewed call for comprehensive immigration reform. “To me, justice for immigrants is one of the great human rights issues of our time,” he said.